Breast reconstruction with your own body tissue. Our plastic surgeons at Palm Aesthetics Plastic Surgery Center are trained and experienced in flap surgery, an advanced microsurgical technique in breast reconstruction where tissue is lifted from a different part of the body (donor site) with the blood supply intact and moved to rebuild the breast. Also referred to as autologous breast reconstruction surgery, this type of procedure is a completely natural procedure as it makes use of a woman’s own body tissue—such as skin, fat and muscle— to reconstruct a breast. Flap surgery also has an increased chance of having the same feeling and sensation as a normal breast due to blood vessels being formed and developed in the autologous tissue as it incorporates with the surrounding tissue. Reconstructed breasts through flap surgery will feel, look and behave more like a normal breast compared to breast implant reconstruction. 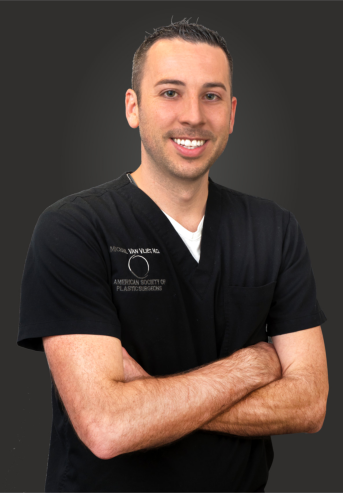 Contact Palm Aesthetics at (941) 822-8955 for more information on flap surgery or other procedures. We serve the Sarasota communities of Ana Maria, Bradenton, Lakewood Ranch, Palmetto, Parrish and Siesta Key. TRAM (transverse rectus abdominis myocutaneous) uses skin, fat, blood vessels and muscle in the lower abdomen, between the waist and pubic bone to rebuild the breast. TRAM flap tissue is very similar to breast tissue, making it a good substitute and the most commonly performed flap surgery. The risk of TRAM flap surgery is that abdominal function may be compromised by cutting through the muscle. DIEP (inferior epigastric perforators), utilizes blood vessels that run through the abdomen, along with the skin and fact connected to them, to reconstruct the breast while sparing any muscle. The blood vessels are harvested and grow with the autologous tissue. Stacked DIEP flap is a newer procedure that is ideal for women who do not have enough abdominal tissue for a standard DIEP flap. 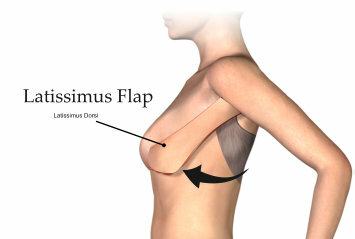 The entire or continuous flap from the lower abdomen is either stacked or folded in half for the breast reconstruction. It is also muscle-sparing, as no muscle is removed or cut. SIEA (superficial inferior epigastric artery), is also a muscle-sparing flap surgery and utilizes the blood vessel that runs just under the lower abdomen for breast reconstruction. It is also sometimes called SIEP (superficial inferior epigastric perforator). SIEA flap differs from the DIEP flap as it uses a different section of abdominal blood vessels. SIEA Flap requires no incision, but DIEP flap requires a small incision in the fascia, the layer covering the rectus abdominis muscle. Latissimus dorsi flap uses the muscle on your upper back, along with the skin, fat and blood vessels attached for breast reconstruction. It is closer to the chest than the abdominal flaps, and is a good choice for women that cannot have TRAM, DIEP, or SIEA flaps due to reasons such as a lack of tissue. TUG (transverse upper gracilis) uses the muscle, skin, fat and blood vessels located in the upper inner thigh to reconstruct a breast. TUG flap is a good flap surgery for women who do not have enough abdominal tissue, or want to achieve a desired breast size. SGAP/hip (superior gluteal artery perforator) is a muscle-sparing breast reconstruction that utilizes the blood vessels, skin, and fat from the upper buttocks or hip. It is an ideal flap surgery for women that are having the procedure done on both breasts and do not have enough abdominal tissue. Your buttocks will be smaller and tighter due to the removal of skin and fat. IGAP (inferior gluteal artery perforator) also utilizes blood vessels from the buttocks, but IGAP uses the tissue on the bottom of the buttocks, near the buttock crease. Stacked GAP flap takes a flap of skin from each upper buttock to recreate a single breast and takes longer than TRAM, DIEP, or SIEA flap surgery. It is recommended to those who do not have enough tissue in the other areas. 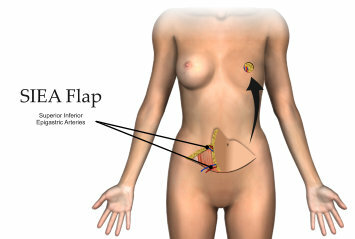 PAP (profunda artery perforator) flap, utilizes a blood vessel that runs through your thigh, along with skin and fat for breast reconstruction. 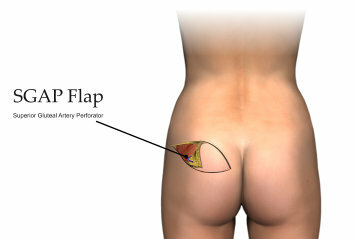 PAP flap is a muscle-sparing flap surgery. Body lift perforator flap reconstruction combines DIEP flap and SGAP/Hip flap reconstruction, ideal for slim women with medium-to-large breasts who are having both of their breasts reconstructed but do not have enough abdominal or buttocks tissue to recreate the size of their breasts. It is also a great option for women who want to replace their breast implants for a more natural flap reconstruction. A flap surgery breast reconstruction forms and develops blood vessels and the reconstructed breast will behave more like a normal breast compared to implant reconstruction. Flap surgery is a longer and more complicated procedure than an implant procedure and adds approximately 3-8 hours, where as an implant procedure adds about an hour. Microsurgery is used to connect the blood vessels from extracted tissue to the existing blood vessels on your chest. 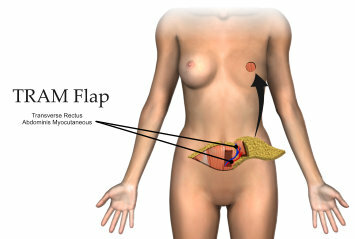 The recovery time is longer for flap surgery due to multiple surgery sites. There is a possibility for additional procedures following your flap reconstruction. There is a possible impact on the area of tissue retrieval, such as loss of sensation or increased risk for a hernia. Tissue death (necrosis) may occur due to insufficient blood supply, a surgeon can trim this area if it is small enough. Loss of sensation may occur at the tissue donor site. There is also a risk of lumps forming due to firm scar tissue replacing fat tissue that had its circulation cut off, which can also be removed.